This is my sons favorite, and one of my favorite cakes to eat and make! 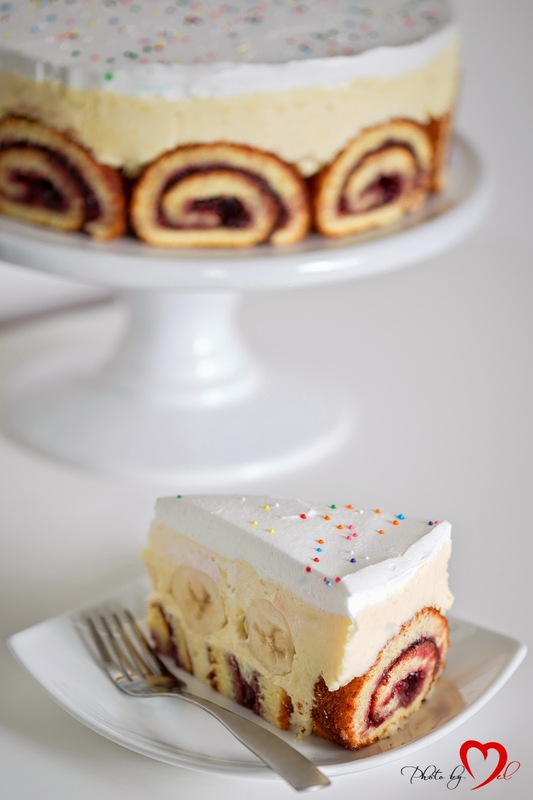 It’s delicious and pretty too, yet all it takes is decorative assembly of a simple jelly roll, vanilla butter cream, bananas and whipped cream on the top. The recipe is used in many places, so I cannot give credit to one particular person, or site, and it varies a bit. Some people put some eggs in the filling, I don’t, and so on. Mix the egg whites with sugar until stiff, then add the yolks, one by one, then flour mixed with baking power. Bake in a jelly roll pan lined with parchment paper, @ 385 F until lightly golden. Transfer onto damp kitchen towel, along with the parchment paper, and roll it up. Let it cool down completely, unroll it, and as you do it peel off the parchment paper, spread your favorite jam or jelly on (not too much, you don’t want it oozing out), and then cut it up into slices. Alternative fillingInstead of vanilla pudding use 5 Tbsp of corn starch and some vanilla extract, and instead of 7, use 5 Tbsp of flour. Now, to assemble the cake. Place some jelly roll slices on the bottom of the spring form pan (I did it directly on the plate this time) to create a cake layer. 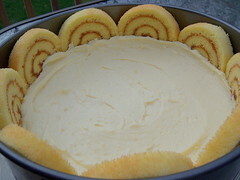 Then put jelly roll slices around the spring form pan, and as you do this you can start adding the cream, because the slices won’t stick to the form. So, you need to fill half of the cream, then you place bananas in circle, cutting them appropriately to fit them and bending them a little if needed to make the nice circles. In the middle you can put a little piece of banana. Do this fairly quickly, you don’t want the bananas to turn brown, and then put the remainder of the cream on top of bananas. Top with whipped cream. Once they are stuck in all that cream, they won’t brown, and will be fresh when you cut the cake the next day. I say the next day because this cake is the best next day, as bananas sort of release their flavor, and it smells so good, mhmmmmm, yummy! Enjoy! i have some homemade jam needing using and the roll would be perfect for it...wonderful dessert! HOLY-MOLY! This is the most decadent thing I have ever seen. I bet your whole family talked about your amazing dessert more than the sweet little baby that was baptized. Congratulations to your cousins! How wonderful that you can all celebrate together. Wow! That is so cool! Guests would be amazed. Thanks for stopping by my blog and for the nice comments! 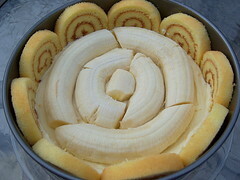 I have to say that this Banana Roll Cake looks fantastic! Looks and a great taste...you can't go wrong! What a beautiful cake Medena! 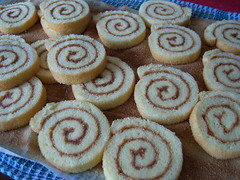 Did you know that the recipe you're using for jelly roll is a very old Serbian recipe for rolat. My grandmother used to scrapbook from Politika newspaper. She cut out the recipes and fashion trends (1948-1949!) ;) I saw the recipe there. This is so great that the recipe survived so long! I didn't know that! I am not surprised though, I come from formerly Yugo; Serbian from Croatia, and my late mother in law was a career cook. She taught me many things about cooking and baking, and I am continuing many of her recipes. what a beautiful cake! I love the slices around the side - they have a mesmerizing effect! Wow, what a beautiful dessert! Medena, this looks gorgeous! I have never seen anything like that! My daughter is standing next to me and she says "I want to bake it, too" She really means it, too. Continues:"And I really like it." This is a keeper, for sure!!! You are so talented! Looks like my daughter's age. Definitely make the cake, and tell me how you liked it. What a beautiful blog you have and I love the banana cake! Medena ~ this is one of my favorites! i love sponge cake, esp. rolled and I LOVE bananas n' cream. This reminds of some of the Danish cakes (sponge cake textures) I just posted about and btw I FINALLY posted my official thanks to you for the E-award just now! I am going to copy the link to your banana roll cake and forward it to my honey....I want him to bake this cake for me on my birthday! Wow-what an awesome cake! You did a super job! I bow at your feet! This is definitely a cake that I want to make real soon but I need a really worthy occasion! Thanks for sharing! medena ~ what is AP flour? I can already smell this cake! It is all purpose flour! excited to let you know, my hubs just made this!!! It's patiently waiting in the fridge as we speak - will take pix of this and let you know. My dear TM girl, you made my day! I hope you will like it; I am now thinking of making it again, I love this cake! look so delicious!! i want to make it as well!!! Can i ask what is AP flour stand for? My english is no good,but I'm gonna try to say all the best for this cake. This is what I call perfection. 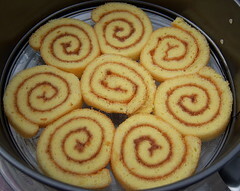 I have one question:can you tell me dimension of jelly roll pan? Hi there anonymous, thank you! I have used 12.inch x 17.5 inch, but most of them come in 13x18, and that would be just fine. Thanks for this fabulos recipe. This cake looks delicious! I am a chocoholic and was wondering if it would be possible to spread a chocolate frosting over the sponge cake before you roll it up, instead of jelly? I've never tasted a buttercream filling like the one you use so I wasn't sure it would go together but the combination of bananas and chocolate is irresistible to me! The frosting I usually use is made of dutched cocoa, a small amount of powdered sugar, corn syrup and a lot of butter so it firms up quite a bit upon chilling. Oh, and one more question for you, please. How many ounces are in a package of Dr. Oetker pudding, so I can find a similar substitute? Thank you so much! i made this cake,thank you,it is very good and the look is gourgeous! So, yes, chocolate buttercream can definitely be used, it's a fabulous idea, I might just do that myself soon!!! Can I ask the size of spring form to assemble the cake? LS Cooks ... Stir It Up!